Do you know any schools that have all HD projectors in the classrooms yet? I remember the days of the Polycom Viewstation and VSX 7000, when you could just buy the codec, and plug it into any projector in any classroom in the school (via S-Video). Now, I have a school looking to replace a unit, and we’ve run into a bit of a problem! The classrooms don’t have HD projectors! The new projectors they are buying this summer are NOT HD projectors! So… if they want to invest in a new Polycom HDX or Tandberg Edge or C20… they need an HD display! Which they don’t have in the classrooms. You can no longer buy a codec and run it around the school / district plugging into whatever display is in the classroom. Is that really true? Please someone, prove me wrong! Does it seem this way to you? Is desktop VC getting more attractive? Does it seem to you also that for ease of use and implementation through the whole school it might be easier to use desktop videoconferencing pushed beyond it’s design limits to show and share for the whole classroom? instead of trying to get the hardward based – HD videoconferencing working? I still like the ease of use of videoconference carts. But I was hoping we’d be able to soon have solutions that could be in every classroom. 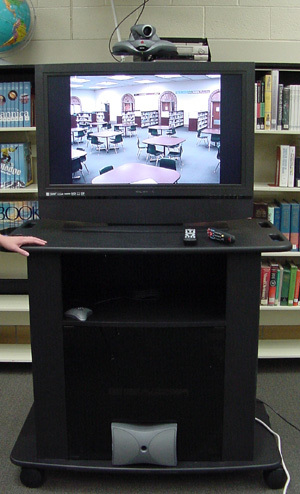 But a cart with an HD flat screen might still be the way to make VC the simplest for teachers. No fiddling with the settings and connections as you have to for desktop VC solutions. I suspect the vendors think HD is the way to go now; but don’t realize that K12 schools are a few years away from having a proliferation of HD projectors. Just thinking out loud here… do you agree? Do you notice this problem also? Is it just that our area is more rural and funds are tighter? How is it in your area? Please comment! As the end of the school year looms, are you also cleaning up accounts and spending last bits of funds? Doug Johnson has blogged in the past about ways to spend “budget dust“. I think it’s a great term to describe that last little bit to spend at the end of the school year. If your district requires preferred vendor documentation, just do it once instead of for each provider! Minimum membership is $595 and you can get a custom quote. The certification process eliminates test calls! While you’re at it, if you are a TWICE member (or were thinking about it), you might as well buy membership for next school year too! Access to special facilitated projects such as Holiday Hoopla and Poetry Idol! Plan now to expand or sustain your videoconference program for next school year! United States House of Representatives housed in Washington, D.C. began with its first Congress March 4, 1789. It was not until recently Congress had the ability to use e-mail and videoconferencing to communicate to constituents. Teachers can videoconference to the House of Representatives by contacting their Representatives FIRST then the House of Representatives Videoconference Director. This conversation with Mr. Upton is tailored to the students questions. Teachers and students work ahead of time to generate questions on various current issues. During the video conference Mr. Upton will introduce himself and the schools participating will take turns asking their questions. Video clip from March 13, 2000. Get QuickTime. The Center for Puppetry Arts uses the latest technology to offer nationwide Distance Learning programs for K-12. Hands-on puppet building workshops are conducted via videoconferencing and are tailored to specific classroom topics and curriculum. The arts are infused with science, social studies, language arts and other disciplines to create a dynamic, interactive virtual classroom for a virtual field trip experience. Programs complements national curriculum standards in language arts, social studies, science, math and other areas. The Center provides a comprehensive study guide and materials list. Each student will construct a Butterfly Marionette while participating in learning activities about the lifecycle of the butterfly, what makes a butterfly an insect, coloring and camouflage, moths, and the similarities and differences between caterpillars and butterflies. Video clips and photographs of the different stages in the life of a butterfly are included. This is a great arts and science lesson all in one! Video clip from May 24, 2000. Get QuickTime. Thank you to everyone who has already voted! If you haven’t, please vote soon! Berrien RESA is hosting 6th Annual Teacher’s Favorite Awards to select the Best Content Providers for the 2009-2010 school year. Results will be shared via the Berrien RESA VC Content Providers Database and the videoconferencing listservs. Many of you use the Berrien RESA VC Content Providers Database. Polycom has chosen to do a drawing for prizes to random participants of the survey to encourage participation. If you wish to be included in the drawing, add your contact information at the end of the survey. Polycom will select the winners randomly. You must complete the survey by May 19, 2011 to be included in the drawing but voting will be open through June 3. Did you see these blog posts yesterday? Just got an iPad2 for a family member, and was very disappointed to find out that Skype doesn’t do video calling on the iPad2 yet. Read the forum discussion here. If schools want to connect to content providers and other classrooms globally, what should they buy? Do all these changes make it so that teachers need less or more support figuring out how to connect to whoever they want to bring to their classroom? My gut is they need more. What do you think? Seems like full service support providers such as Whirlidurb can make this much more seamless for schools. The array of choices and options is getting dizzying! If you were going to use videoconferencing for full length courses now, what kind of videoconferencing would you choose? What questions and potential changes do you see from these developments? Please comment!